Iowa State Auditor David Vaudt says he won't be running for governor in 2010. In a way, that's disappointing, since Vaudt has been one of the few high-level officials to acknowledge the huge fiscal troubles that Iowa is having. But Vaudt says he will run for re-election to the auditor's office, where he can continue to make noise (as he does in a recent video) about the way the government is running up debts it has no reasonable way of paying. Iowa's government is spending more while bringing in less and without a plan to knock that off, the state's future growth is in trouble. At this very moment, the National Weather Service has flash flood warnings in effect for Clarke, Adams, Union, Taylor, Ringgold, and Decatur counties. Flash flood warnings are a pretty big deal, since they represent immediate threats to life and property. But even though more than 45,000 people live in those six counties (at least according to the Census figures), live online news coverage of the area is difficult to find. Clarke County has the Osceola Sentinel-Tribune, which has a pleasant-looking site, but no information on flooding anywhere to be found. The Adams County Free Press only appears online in historical archives. Union County has the Afton Star-Enterprise (not to be found on the Internet) and the Creston News-Advertiser, which, like Osceola's paper, has a nice-looking website (thanks to its Illinois parent company), but no news about the flooding. Moving into Taylor County, the Bedford Times-Press has no coverage of the floodwaters, and the Lenox Time Table appears to be AWOL online. Ringgold County has the Diagonal Progress, with some nice photos of Diagonal but no news content, and the Mount Ayr Record-News, whose site is down at the moment. And in Decatur County, neither the Lamoni Chronicle nor the Leon Journal-Reporter has an online presence. Considering how the Des Moines Register has abandoned all but the "Golden Circle" around the metro, it's no surprise that the paper appears to have nothing on the flooding story either -- nor do any of the other metro media outlets. It's really not a blame situation: Times are tough, and small-town newspapers are often run on a shoestring. But in many places, the stories that really need to be covered in real-time (like flooding) are being missed online, where it would seem reasonable to turn first. To an outsider, the shooting in West Des Moines probably doesn't sound like much of a big deal. But to locals, it's a big story. Police-involved shootings seem like a DC thing. (That's not for lack of good reason: In Washington, they measure police-involved shootings in percentage terms.) The official report on crime statistics for West Des Moines reads with an almost Disney-esque lack of trouble. A city of 56,000 people reported just 32 robberies for the entire year. So here's the interesting part: The shooting, which was reportedly based on a warrant executed in connection to a series of home invasions and rapes, involved three police officers, each of whom fired his weapon. So in one incident, West Des Moines police firearms saw more active-duty, non-practice use than in a normal year. The new Mercy West Lakes Hospital in West Des Moines is quickly approaching completion, but someone really needs to explain why they chose to add a gigantic four-story, brightly-lit cross to the side of the building. Yes, the cross is stylized in the Mercy fashion, but for heaven's sake (pun intended), why did they make the thing so large? Count the number of levels for yourself: It covers four complete levels of the building, and faces out into traffic along 60th Street and Westown Parkway. At such a height, it dwarfs everything around, except for the hospital itself. The Hy-Vee corporate offices across the street are only two stories tall. 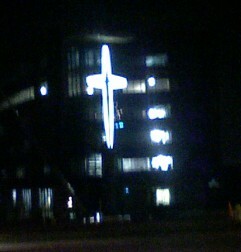 The cross is just too large, and it's undoubtedly going to create traffic accidents. Mercy is an excellent medical center in its own right; this kind of advertising (if that's what it's supposed to be) doesn't befit the standards of the organization itself. Continue reading Dear Mercy: Please turn down the lights.